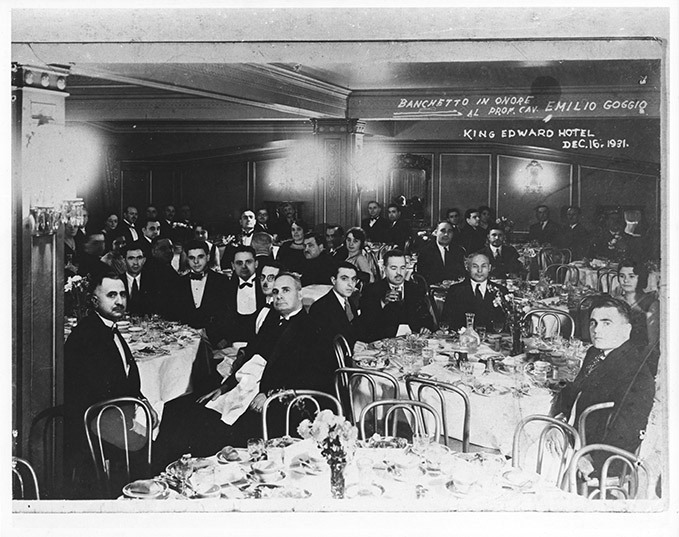 Black and white photograph of banquet held at the King Edward Hotel, honouring Professor (Cav.) Emilio Goggio, Toronto, ON, December 16, 1931. Goggio was a professor in the Italian and Spanish Department at the University of Toronto, and later the Chair of the department. In attendance at the banquet was Italian Vice Consul Ambrosi, and other intellectuals and leaders of the local Italian Canadian community. On June 10, 1940, Goggio was arrested and briefly detained. He seemed to have been on friendly terms with the Italian consulate, was sympathetic to fascism, and had given money for the Casa d'Italia in Toronto. He was released on July 11, 1940. Officials at the University may have intervened on his behalf. There are two pictures taken at this event (see LDICEA2012-0006-0018).